Oats are annual grasses, and are used as both for both human and animal nutrition, in addition to other purposes. They are a commonly grown crop in the world today. However, they bring with them a somewhat tempestuous history. 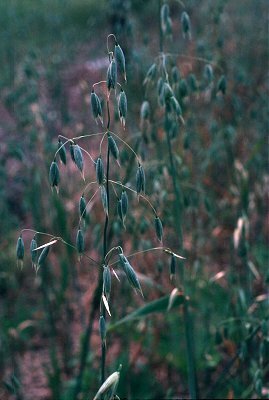 Modern oats probably originated from the Asian wild red oat which grew as a weed in other grain crops (3, 6, 12). Archaeological studies show that oats have been found dating from about 2,000 BC, but these grains were probably simply weed seeds (3). It was probably much closer to the birth of Christ before, as the last of the cereals to be cultivated, oats were purposely grown in southeast Europe or Asia Minor (3, 6, 12). Before being used as a food, they were used for medicinal purposes (4, 6). Oats have a couple of traits that caused them to be less favored than other grains - a bland taste and a tendency to spoil. Greeks and Romans considered oats to be diseased wheat (12), and many cultures believed them to be better suited to animals (10). 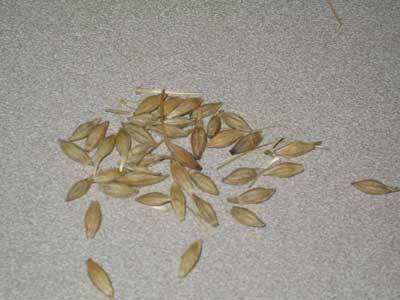 Despite these issues, oats became a staple in Germany, Ireland, Scotland, and the Scandivian countries (4, 6). It is from thedebate about the palatability of oats that the comments from Samuel Johnson's dictionary stemmed (see quote at top of page). Oats were introduced to North America with other grains by Scottish settlers in 1602 (3, 6). They gradually became a major crop until about 1920, when machines began to replace horsepower (6). Acreage previously devoted to feed oats has now been replaced by soybeans, a more marketable crop (3). With the advance of knowledge about nutrition, oats were recognized as a healthy food in the mid 1980's (10) and therefore may become more popular once again for human nutrition. Medicinal purposes - Protect against cancers and heart disease, enhance immune response to infection, stabilize blood sugar, sooth skin conditions and other ailments, as well as use as an antispasmodic, a diuretic, an emollient, a nerve tonic, a supplement, an aphrodisiac, and a stimulant (4, 5, 10, 11). Agronomy - Cover crop grown for a weed barrier or as a starter crop (natural herbicide), erosion control, groundcover, fertilizer, mulch and biomass(4, 5, 11). Consumption: whisky, coffee substitute, hay, pasture, grain. (4, 10, 11). Other: Cosmetics, fibers, paper, animal bedding, pillow filling, thatching. Hulls and waste products are used in the refining of lubricant oils and rosins, the manufacture of shoe dyes, herbicides, fungicides, and soil fumigants, and the production of nylon. (5, 9). Atlas of Florida Vascular Plants (http://www.plantatlas.usf.edu/main.asp?plantID=391) AVENA FATUA Linnaeus, var. SATIVA (Linnaeus) Haussknecht, Mitt. Geogr. Ges. (Thüringen) Jena 3: 238. 1885. FAOSTAT data, 2006. Last Accessed 4/14/2006. Gibson, L. & Benson, G. (2002). Origin, History, and Uses of Oat (Avena sativa) and Wheat (Triticum aestivum). Iowa State University, Department of Agronomy. Accessed 4/14/2006. North American Millers' association (2000). Oat foods: A smart choice. Retrieved April 14, 2006. Plants For A Future (2000). Accessed 4/15/06. Avena sativa. Plants for a Future, Blagdon Cross, Ashwater, Beaworthy, Devon, EX21 5DF, UK. Small, E. (1999). New crops for Canadian agriculture. p. 15-52. In: J. Janick (ed. ), Perspectives on new crops and new uses. ASHS Press, Alexandria, VA.
USDA, NRCS. (2006). The PLANTS Database, 6 March 2006. National Plant Data Center, Baton Rouge, LA 70874-4490 USA. Vandaveer, C. (2004). Oats, past and present. Accessed 4/14/2006. Whole Grains Bureau. Accessed 4/14/06. History of Whole Grains. Wikipedia contributors (2006). Oat. Wikipedia, The Free Encyclopedia. Retrieved April 14, 2006 from http://en.wikipedia.org/w/index.php?title=Oat&oldid=48827875. Williams, John K. (2003) A Brief History of Oats - And How You Should Eat Them. Accessed 4/14/2006. Wisconsin Botanical Information System. Avena sativa L. Wisconsin State Herbarium - University of Wisconsin-Madison. Accessed 4/14/2006.